During Easter 2018, the REAP Project once again travelled to Uganda for 10 days to take on our second mission trip. Our team were excited to be returning to continue to help the school and community grow and develop. This time 10 men travelled – 7 of the original group and 3 new faces. Fundraising for our trip amounted to more than £23,000. Adding this to our surplus money raised from REAP 2014, we had a total of £36,000 to contribute towards REAP 2018. This fundraising allowed us to exceed our initial target of £27,500. The funds amounting to our initial target were used to add another water tank onto the school and finance the construction of a staff accommodation block. This was vitally important as it will allow teachers with long commutes stay at the school in order to improve the standard of teaching at Ryamugwizi. Due to exceeding our initial target, we were also able to carry out the securing of a natural spring that will provide clean, fresh water for the community for years to come. As well as more projects in areas of education, health promotion and small business opportunities. 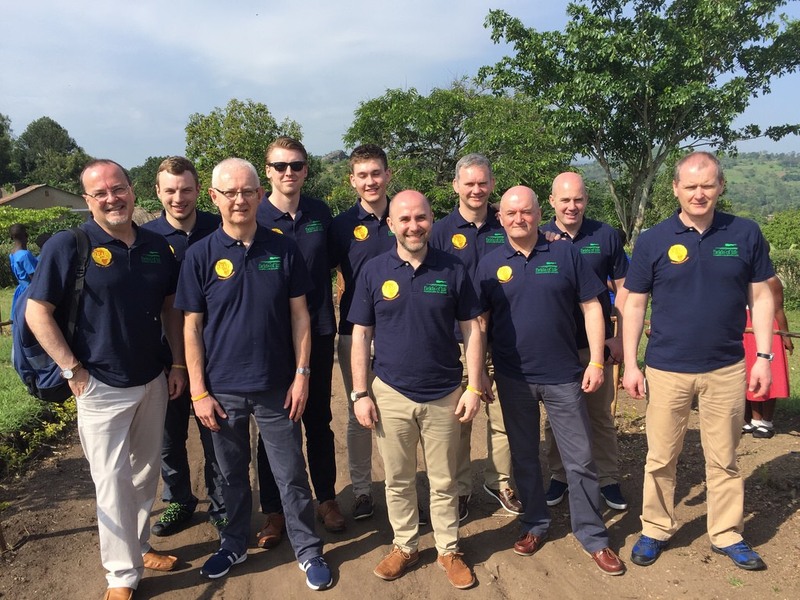 After an overnight in Kampala, followed by a Pastor Deo led tour of the Kosovo Slums, the team set off on the eight hour journey to Ibanda, south west Uganda. After a much-needed night’s sleep, we made our much-anticipated return to Ryamugwizi Primary School and a hugely emotional and traditional welcome from the pupils, before celebrating a very special Easter Sunday with the Ishingororo community. Building on our previous development work, which included a classroom block, pit-latrines and kitchen block, the group returned to oversee some essential hygiene teaching, outdoor games, further classroom refurbishment and the handover of a new state-of-the-art REAP funded staff house. In addition, the team were able to observe the early construction work relating to the securing of a natural spring well in the local community. The completed staff house now includes solar lighting and each room has been furnished with a bed and lighting. Furthermore, the natural spring well has now been secured and for the first time ever, the children of Ryamugwizi Primary School are enjoying access to clean drinking water. The team were blessed with good health throughout their stay and were supported expertly by Keith Mutabazi (FOL Ugandan Partnership’s Liaison Co-ordinator) whose guidance was simply flawless. The team so enjoyed his company including his many Northern Irishisms! On behalf of the children of Ryamugwizi Primary School, Ibanda, Uganda, the REAP Project Team wish to thank the numerous number of individuals and the many businesses, churches and schools for their remarkable generosity in supporting our work. The smiling faces when the packs were handed out and the accommodation block handed over, say far more than any words could ever convey and we can assure our donors that their kindness has impacted significantly on the families throughout this poverty-stricken community. More than £84,000 has been donated so far to our project and we can not thank you enough. There is still an enormous amount of work to be done at Ryamugwizi Primary School and they have many plans which include the construction of a new nursery block. We hope that with continued support the school will continue to thrive and eventually produce leaders who can drive this whole community forward for generations to come. We are very proud that one of our new team members for this trip was none other than bestselling author, broadcaster and peacebuilder, Tony Macaulay. Tony has spent the past 30 years building peace and reconciliation at home and abroad, working with hundreds of youth and community groups to break down barriers of mistrust, hatred and division. He has applied his experience and learning into leadership development and management of change and transition in many voluntary, public and private sector organisations. During our trip Tony blogged live from Uganda, detailing his and the team’s experiences. To read Tony’s blog, ‘Stories from Uganda’ please visit Tony’s website at tonymacaulayauthor.com/stories-from-uganda/. We are very privileged to have Tony as part of the REAP team and thank him for his contribution towards REAP 2018.